Casa Blu is situated in a residence with a number of apartments, on a hill with olive trees at just 1.5 km from the beautiful Arco Naturale beach. 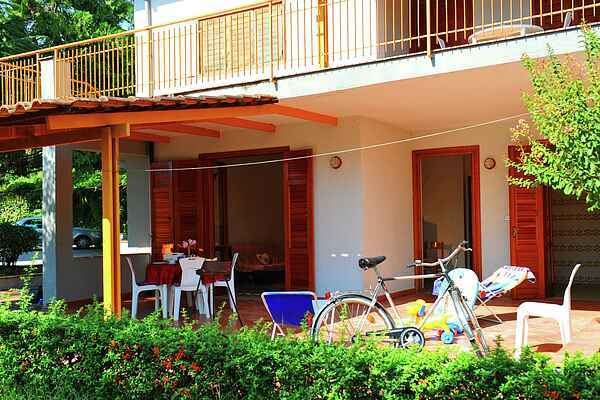 It is a perfect base for exploring the Cilento and the surroundings of Palinuro. The mansion boasts a lighted tennis court, a football pitch, a petanque court, table tennis table and opportunities to learn archery. The swimming pool is 250 m from the holiday home. The holiday home has a basic interior and features a terrace which is a great place for an al fresco dinner. The mansion is near the sea, where you'll find plenty of activities. The coast is truly spectacular with beautiful beaches and dramatic bays and cliffs. There are many interesting caves nearby, such as the Grotta Azzurra, the symbol of Capo Palingra. This cave was named after the various blue colours of the water. Other caves include Grotta delle Ossa, Grotta dei Monaci, Cala Fetente, Grotta del Sangue and Grotta d’Argento. Boat trips and diving are popular activities.